Accomodation: Volunteers will sleep on mattresses provided, please bring a sleeping bag. Extra: Participation fee is EUR 350 (Euros) which can either be transferred in advance via bank transfer, or paid for on arrival in either Euros or Icelandic kronas. a) Revegetation and erosion control using organic materials, b) Tree planting, c) Removal of old fences and d) Monitoring the survival and growth of tree plantations of former years. These tasks will be performed at several different locations in the South-west of the country. The South-west is part of the volcanic belt of Iceland, with vast lava fields and erodible volcanic soils. Additionally, the area has suffered from overgrazing of sheep for a long time. Consequently the ecological condition is rather poor and some areas have completely lost their top soil. Materials like horse manure, garden waste and the likes are the best revegetation means available. The results of the efforts made so far can already be seen at a number of sites in the South-west of the country. Documentation is available and as can be seen, the role of SEEDS volunteers has been substantial. No previous experience is necessary but the work is demanding and might require a good physical condition; it can at times be repetitive and demanding but always rewarding. As it is outdoors work, volunteers shall be ready to adapt and be flexible with the working and free-time schedule, as depending on the weather, we may not be able to perform some of the tasks or activities planned. Volunteers need to be prepared for working outdoors in sometimes isolated sites. Be prepared to experience all kinds of weather and bring warm winter clothes as the tasks take place outside and it can get rather cold. Bring warm under-layers, waterproofs, walking shoes/boots, a good sleeping bag, hat, scarves and gloves. Keep in mind, our earth is getting warmer because of an overload of CO2 in the atmosphere. Also, green plants remove carbon from the atmosphere and capture it in biomass and soil. 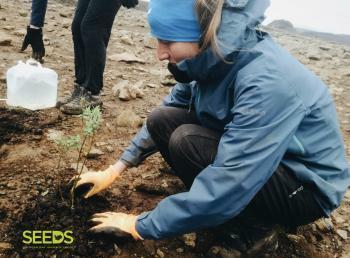 Revegetation is one of the most effective ways to fight off climate change, especially in a land so heavily eroded as Iceland. ACCOMMODATION: Volunteers will be lodged in a school building with basic facilities in one of Reykjavik’s neighbouring towns. Volunteers will sleep on mattresses provided, please bring a sleeping bag. There is a shower in the school and volunteers will also have free access to the local geothermal swimming pool. Food ingredients will be provided and the group will be responsible for cooking and cleaning. Do not forget some traditional/typical food, drinks, music and recipes from your country for the international evening. LOCATION: The work takes place in the vicinity of Reykjavík on different locations. The main emphasis will be on erosion control in ten different sites in the South-west of Iceland, mostly in and around the Reykjanes peninsula, area marked by active volcanism under its surface with numerous hot and sulphur springs around the Kleifarvatn Lake and in the Krýsuvík geothermal area. The Peninsula is famous for its wide network of hiking trails through colourful landscapes, amazing ocean cliffs, bird and whale watching sites and the Blue Lagoon. The camp happens around the summer solstice, when the sun hardly sets and the nights are almost as bright as the days. The bright nights are magical and staying awake enjoying the surroundings is a unique experience. Meeting time will be 18:00 (6:00 pm) in the afternoon of June 8 at SEEDS office in Reykjavík. EXTRAS / SPECIAL REMARKS: Participation fee is EUR 350 (Euros) which can either be transferred in advance via bank transfer, or paid for on arrival in either Euros or Icelandic kronas. The fee includes transportation from the meeting point to the camp and back (on the first and last day), the Golden Circle and Snæfellsnes peninsula excursions (1 full day-trip each), where we will visit spectacular waterfalls, geysers, impressive coastline, the National Park of Thingvellir and much more. Other excursions (like South Shore or Hot River hike) can be arranged at discount fares for SEEDS participants n case there is additional free time. Volunteers need to be prepared for physical demanding work. Bring warm and waterproof winter clothes as the project takes place outside and the weather can get very cold.